There are still a couple of days left to put your name down for the festive Christmas Day lunch and celebration. 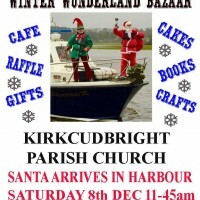 This will be held in the Kirkcudbright Parish Church Hall on Monday, 25th December (obvs!) from 12 noon for 12.40 p.m. Either put your name down on the form in the church porch, or let Doreen Blackadder know. Stephen and Hazel warmly invite all members of the church, new and long-standing, to their annual party to be held from 7pm on Thursday, 3rd January 2019 in the Rectory, Castledykes Road. Everyone is invited to a post-Winter Wonderland celebratory Bring & Share Party at 7 pm on Sunday, 9th December at Belmont, the home of Sue and Nigel. Please bring a plate of finger food, if possible. If you would like transport, call 01557 339171. Saturday, 8th December from 10 a.m. ENTRY IS FREE! Violiin and piano recital by internationally-renowned musicians, Adrian Adlam and Thomas Hell, who will perform works by Beethoven and Schubert. Service at the War Memorial starts at 10.45 am, followed by a service in the parish church. No morning service at Greyfriars or St Mary's. Sung Evensong at 6 pm in Greyfriars, which will include Cecil Coles' 'Te Deum'. Coles was a Kirkcudbright-born composer who died in April 1918. There will be an ecumenical service on Sunday 9th September at 3 pm to commemorate the 800th anniversary of Tongland Abbey. (No, me neither, but come along and find out!) The rector, Fr William McFadden and Rev Val Ott will lead the service and provide the historical detail. Period music will be provided by the Balliol Consort. The venue will be in a marquee in Tongland, next to the Abbey. will include Eucharist, and space for silent prayer and meditation. Tea and coffee will be provided, please bring your own lunch. Training as authorised Lay Worship Leaders will be offered in the Galloway Region during August and September. The course will take place over 5 sessions and is a requirement if the individual is to be licensed by the bishop for this role. It can also be viewed as a refresher course to those already licensed. Bishop Gregor and Revd Canon Gordon Fyfe will offer this training. The dates for this year's Trail are 3-6 August inc. Even more venues have been added this year, and the special visitor will be the Sea Hamer (a beast that usually roams the hills behind Moniaive) to be displayed on the Fisherman's Green during the Trail. The wicker beast was created by artists Trevor Leat and Alex Rigg of Oceanallover.